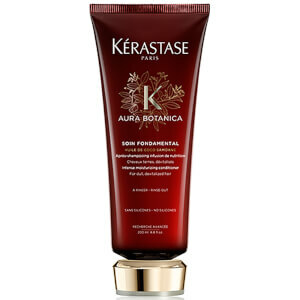 Save up to 33% + receive a FREE full sized Kérastase Aura Botanica Soin Fondamental Conditioner when you spend £70. 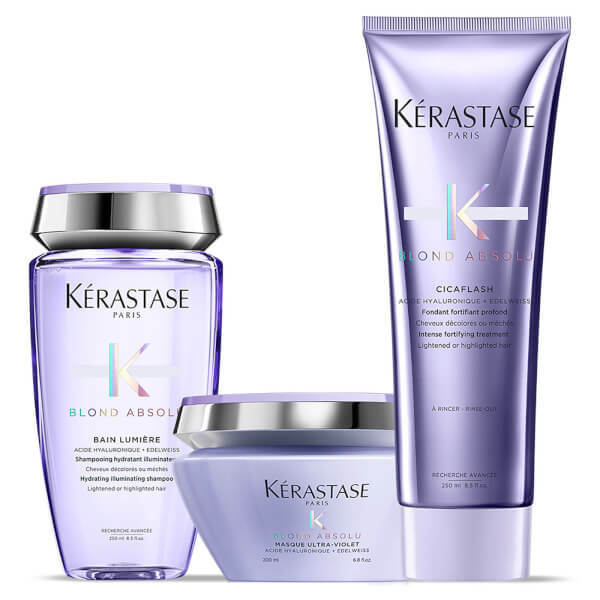 The Kérastase Blond Absolu Lumiere Shampoo, Conditioner and Masque Trio work in synergy to reveal radiant and revitalised locks. Designed to brighten and cleanse blonde hair. A nourishing cleanser ideal for lightened, highlighted or grey hair. The silky, luxurious formula cleanses strands from root to tip to rid hair of excess oil and impurities, while a hydrating blend of Hyaluronic Acid and Edelweiss Flower replenishes vital moisture. The shampoo delivers powerful antioxidant protection to protect locks against environmental damage, brightening and boosting blonde tones for a vibrant, radiant and healthy-looking finish. A weekly hair mask for lightened and highlighted locks. The purple formula helps to banish brassy and yellow tones while protecting against dullness caused by pollution and other environmental aggressors. Hyaluronic Acid and Edelweiss Flower combine to deliver high levels of soothing moisture, rebuilding weak hair fibres and infusing strands with a healthy, salon-worthy gloss. A weightless and luxurious formula that delivers the deep nourishment of a hair mask with the lightweight finish of a conditioner. The shimmery gel has a soft lavender hue and is infused with Hyaluronic Acid and Edelweiss Flower to replenish intense hydration to every strand, rebuilding and strengthening the fibre to minimise breakage. The conditioner helps to create smoother, softer and silkier hair with a radiant finish. Shampoo: Wet hair then thoroughly remove excess water before applying a coin-sized amount of shampoo touch by touch onto 5 key zones of the hair. Add water and emulsify. Focus this first wash on the scalp using finger tips to massage the scalp and remove impurities. Rinse thoroughly. Apply a second coin-sized amount of shampoo touch by touch and add water. The second lather will produce a more abundant foam which will help cleanse lengths all the way to the ends. Rinse thoroughly. Hair Mask: Apply on washed and towel-dried hair. Massage onto lengths and ends. Leave-in for 5 minutes for light neutralisation or longer (up to 10 minutes) for stronger neutralisation. Add water, emulsify and rinse thoroughly. Cicaflash Fondant: Apply a hazelnut sized amount on washed and towel-dried hair. 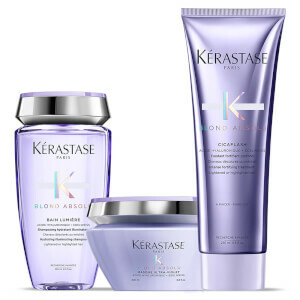 Massage through mid-lengths and ends, avoiding roots to ensure lightweight volume. Leave in for 2 to 3 minutes. Emulsify and rinse thoroughly. Lumière Shampoo: Aqua / Water, Sodium Laureth Sulfate, Glycerin, Coco-Betaine, Sodium Chloride, Cocamide Mipa, Citric Acid, Sodium Benzoate, Sodium Hydroxide, Hexylene Glycol, Hydroxypropyl Guar Hydroxypropyltrimonium Chloride, Salicylic Acid, Limonene, Tocopherol, Leontopodium Alpinum Flower/Leaf Extract, Sodium Hyaluronate, Malva Sylvestris Flower Extract / Mallow Flower Extract, Potassium Sorbate, Parfum / Fragrance. C224268/1. Hair Mask: Aqua / Water, Cetearyl Alcohol, Paraffinum Liquidum / Mineral Oil, Dipalmitoylethyl Hydroxyethylmonium Methosulfate, Cetyl Esters, Cetrimonium Chloride, Citric Acid, Sodium Benzoate, Sodium Hydroxide, Caprylyl Glycol, Salicylic Acid, Ci 60730 / Acid Violet 43, Limonene, Glycerin, Sodium Hyaluronate, Tocopherol, Ci 45100 / Acid Red 52, Leontopodium Alpinum Flower/Leaf Extract, Malva Sylvestris Flower Extract / Mallow Flower Extract, Potassium Sorbate, Parfum / Fragrance. C224934/1. Cicaflash Fondant: Aqua / Water, Cetearyl Alcohol, Amodimethicone, Hydroxypropyl Starch Phosphate, Isopropyl Myristate, Behentrimonium Chloride, Phenoxyethanol, Trideceth-5, Isopropyl Alcohol, Trideceth-6, Glycerin, Peg-150 Distearate, Caprylyl Glycol, Trideceth-10, Limonene, Cetrimonium Chloride, Citric Acid, Sodium Hyaluronate, Serine, Tocopherol, Acetic Acid, Ci 60730 / Ext. Violet 2, Leontopodium Alpinum Flower/Leaf Extract, Malva Sylvestris Flower Extract / Mallow Flower Extract, Sodium Benzoate, Potassium Sorbate, Parfum / Fragrance. C224142/1.